BOOROONGEN Djugun College near Kempsey is celebrating its 17th year of successfully achieving AS/NZ ISO:9001 quality certification, one of only a handful of organisations on the Mid North Coast to carry the prestigious five-tick certification. Originally assessed for quality ISO certification in 2001, the college has successfully passed each annual audit undertaken to measure compliance to the rigorous certification. Late last year Booroongen Djugun College’s audit identified no non-conformances again for the 17th year running, with SIA Global granting them an upgrade to the latest standard, ANZ/ISO 9001:2016. “The excellent result of the transition to the latest ISO accreditation is due to the college staff. The result is a reflection of their total commitment to student services and continual improvement of the college’s systems,” director of Training and Services, Faith March, said. Offering 25 courses, from Certificate II to Diploma, in areas of Business, Aged Care, Health, Community Services, and Conservation and Land Management, Booroongen Djugun executive management believe their continued commitment to quality allows them to best support their students. “We are very proud of our organisation’s contribution towards the continuation of our ISO quality certification. Applying best-practice to our administration processes means we can focus our resources to our students –delivering high quality training, mentoring and tutoring so they can excel,” director of Operations, Val March OAM, said. As part of maintaining the ISO quality certification, regular compulsory course feedback is undertaken by students to gauge their satisfaction with the performance of their trainers, and desktop spot audits ensure administrative compliance to all areas of operation, especially legislative requirements as a Registered Training Organisation. To find out more about Booroongen Djugun College’s commitment to quality, or training opportunities, visit: booroongendjugun.com.au/college. The Hon. 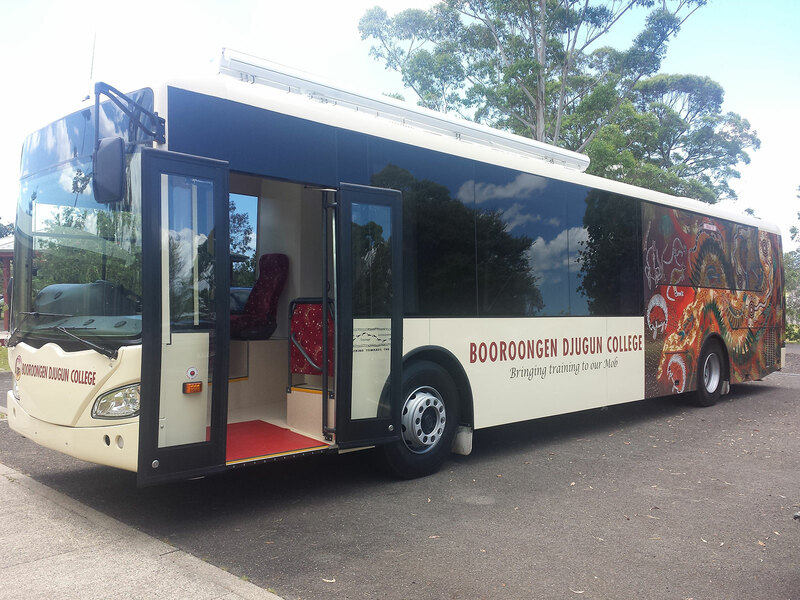 Luke Hartsuyker MP, Federal Member for Cowper, Assistant Minister for Employment and Deputy Leader of the House, officially launched Booroongen Djugun College’s Mobile Training Unit on behalf of the Australian Government. The community was represented by Mid North Coast Aboriginal organisations, Kempsey Shire councillors, school principals and students, job networks, TAFE, Australian Red Cross, North Coast Medicare Local, Police Local Area Command, and Diabetes NSW. The Welcome to Country was performed by Uncle Bob Smith, a Dunghutti Elder and attendees were entertained by the Dunghutti Traditional Dancers. Also in attendance was Uncle Richard Campbell who is the artist responsible for the outstanding artwork displayed on the training unit. The training unit is a coach which has been fully fitted out as a training centre, complete with work stations, projector screen, internet access and other facilities, all designed to provide classroom facilities which are totally mobile. Co-founder and Director of Operations of Booroongen Djugun Limited, Val March OAM, said the mobile training unit would go to places that do not have training facilities in the area and is especially funded for our Aboriginal community. The main purpose is to give people accredited training to have them job ready and competitive in the job market. The training unit is designed for the delivery and expansion of accredited Vocational Education Training (VET) for up to 20 students at a time. The unit will be demand driven and would be working in partnership with jobactive organisations to ensure that people who want to use the facility will have access to it.